Baby is the size of: An Endive or Mango – which I thought is like 5-6″ but my app says 10 inches. Weight gain: 10 pounds man! I hope I can stay at this pace. Maternity clothes: Loving them. Mostly just pants – I can still wear my tanks, sweaters and jackets – even if they don’t button or zip anymore. Stretch marks: Nope. I’m doing well! Sleep: I’ve come to the conclusion if I sleep next to my Snoogle, I sleep like crap…but if I actually sleep WITH my Snoogle, I sleep like a baby. 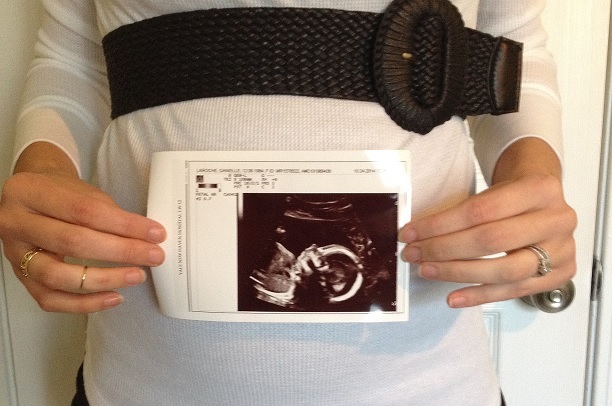 Best moment this week: Two Ultrasounds! Seeing those cute little fingers and toes and the little nose. AH so cute. Worst moment this week: Two Ultrasounds. haha Just hoping everything keep developing properly! Miss anything: Sleeping on my stomach. Movement: It’s getting stronger and more frequent everyday. I feel maybe 4-6 moves every hour! The tech asked if I get any sleep at night because the baby was moving constantly…but I don’t feel a thing at night. Cravings: Still that ground beef…in any form. Labor Signs: No labor signs, just cramping/tightening. Symptoms: Nothing crazy. Starting to get SOME heartburn, but only if I eat something hot. Wedding rings on or off: Rings are still on. I think the only weight gain has been in the belly. Here’s hoping it stays that way – the brownies I made last night are not helping with that. 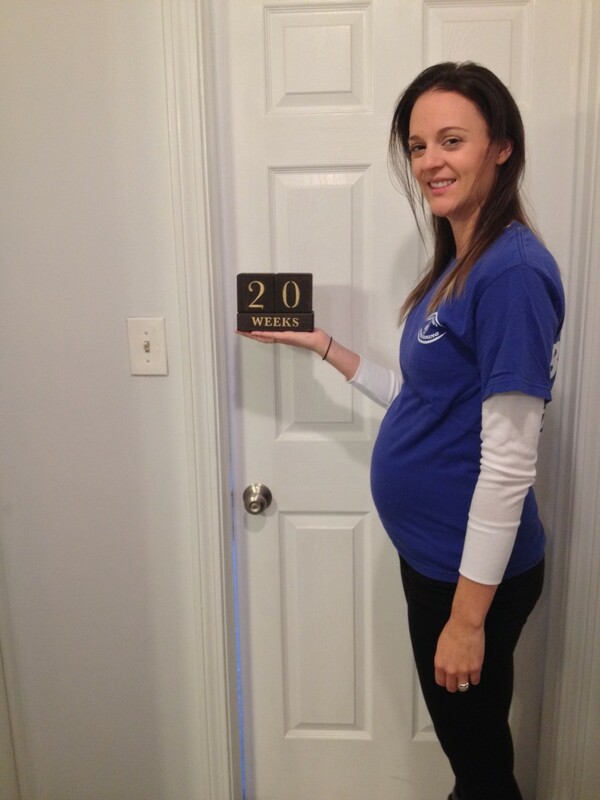 Looking forward to: My Shower in November and next Ultrasound in December. I figure it’s only appropriate to do a little “before” and “after” which isn’t really the case. 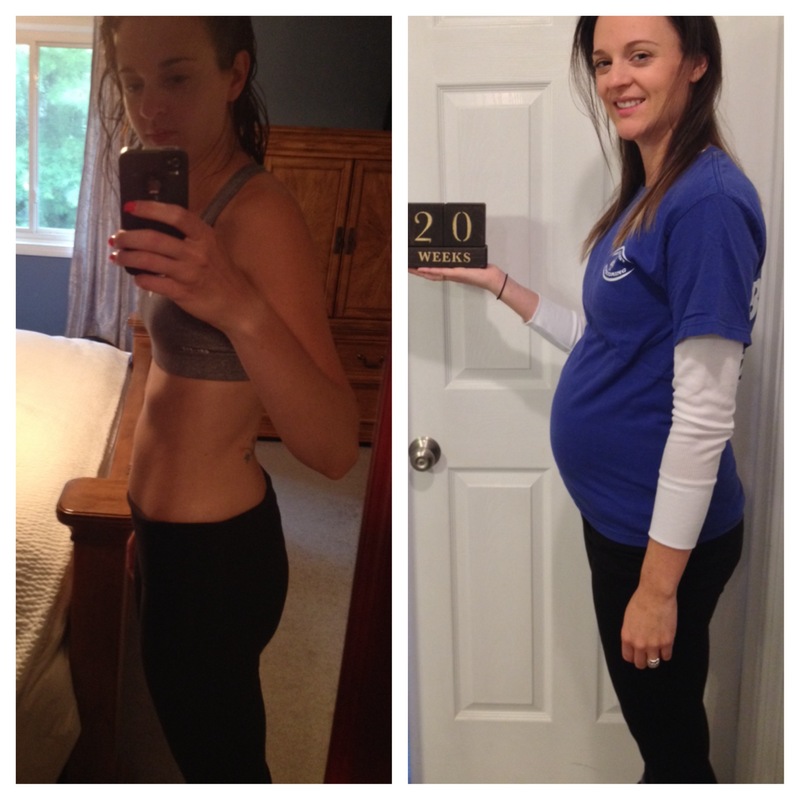 Here is a picture the morning I took the test which was at 4 weeks and me now at 20 weeks! This is definitely nuts to look at…I forgot what that body was like. I already look like a Mama. We had a couple Ultrasounds this week. The big one on Monday which my parents were able to come to and see the little nugget. They check the anatomy completely from the top of the head to the bottom of its feet and make sure everything is there and looking normal. We then had to have a follow-up on Friday to make sure some things were looking OK. We have our next one in 2 months to make sure things are progressing fine. It’s been fun getting to see this little creature more often. It’s difficult to get a good picture of the whole body…and the techs are still slacking on that, but here’s our little pumpkin. It’s nose and lips are the cutest little things ever. These next 20 weeks can’t go fast enough!! This entry was posted in Uncategorized on October 25, 2014 by Danielle Laroche. You know what that “heartburn” means don’t you? Supposedly, lots of hair. I had a lot of heartburn when I was pregnant – Jen & Sara both had a headful, but Kevin was born with just peachfuzz. I was a hairy beast, but Mom didn’t have any heartburn.